"How To Break Through The Toughest Plateau And Boost Metabolism"
It's vitally important to replenish your fluids by drinking plenty of water on your weight loss program. An inadequate supply of water in itself can slow down your weight-loss. Carry water with you wherever you go throughout the day. For additional weight-management benefits, add a high quality “greens drink” to your water to help enjoy a healthy metabolism. Keeping well hydrated not only helps you burn fat efficiently, it also helps control hunger. 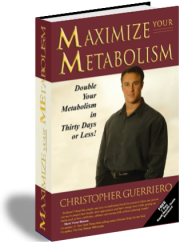 © FastMetabolism.com and Christopher Guerriero. All rights reserved.